Version 5.10 brings new solutions for integration with the following enterprise applications – ConnectWise, Zapier, DBConnector, GitHub, Git Lab, Subversion. To activate your integration, first, you need to switch it on from the Administration panel → Integrations → use the slider button in the corresponding integration tab to switch it on/off. Additionally, the integration tabs allow you to configure your integrations. The Learn more link redirects you to a dedicated technical article with a detailed description of the configuration settings. Kanbanize has already the option to pull an SQL statement data from your local Database and convert it into Kanban cards. In order to cover more use-case scenarios and further more specific legacy systems, we now support three new databases: Oracle, Microsoft SQL Server, PostgreSQL. Edit your workflow and set a background color of your columns to create a better visualization of the process. This new feature will help a lot of teams to distinguish key phases in their workflow e.g. : Waiting on 3rd Party column, Approval column, Blocked cards column. To set a color to a column of your choice-> use the Edit Workflow icon and select it from the color picker that belongs to the corresponding column. When inviting a new user from the Administration panel by typing in an email and sending a direct invitation, the system will open the “Assign User to Boards” panel. This prompts the account administrators to immediately select boards to which they want to assign the user. All boards in the account are listed on the left side of the panel. 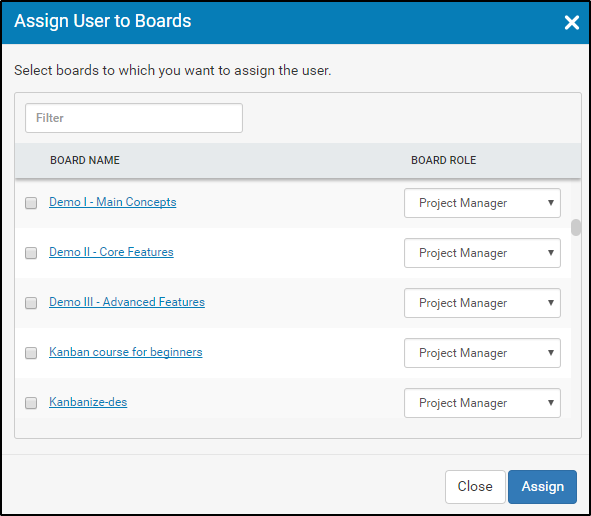 Tick off those boards where the user will operate and define the user board role from the drop-down menu on the right -> click on the Assign button to confirm it. Note: If you have provided the user with administrative rights upon sending the invitation, the Board role dropdown will not be active and will reflect the Administrator status. 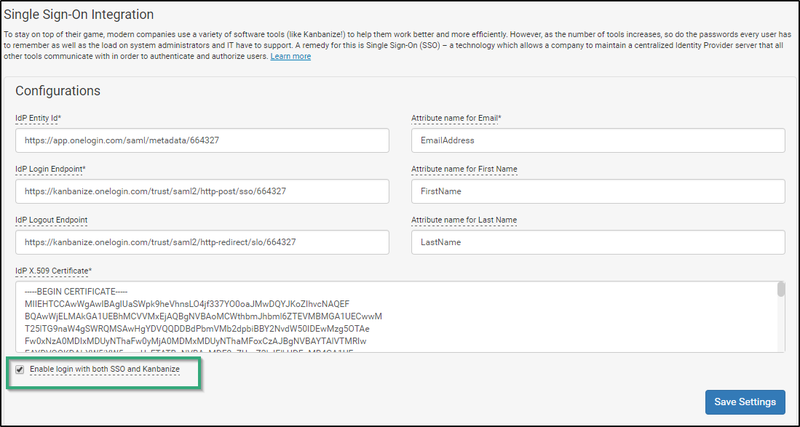 This option allows users (e.g external consultants; customers) without accounts in your Idp to get access to Kanbanize. To activate it, open the Administration panel -> Integrations -> Single Sign-On -> checkmark the "Enable login with both SSO and Kanbanize credentials" at the bottom of the SSO Configuration panel. With the new release, the background of the “N” letter icon for all unassigned cards will be in light gray color to create better identification for the rest of the users. Once a card is assigned to a team member, the background color of the assignee icon will transform to match the current card color. The “N” letter will be replaced by the first letter of the assignee’s username unless this user has uploaded an avatar.